The Western is historically preoccupied with masculinity. Abandoning the easy life of the East meant that the only thing tougher than the elements was the self-image of those braving them. Manifest Destiny decreed that the Wild West be free of weakness or disability—a desert Darwinism. 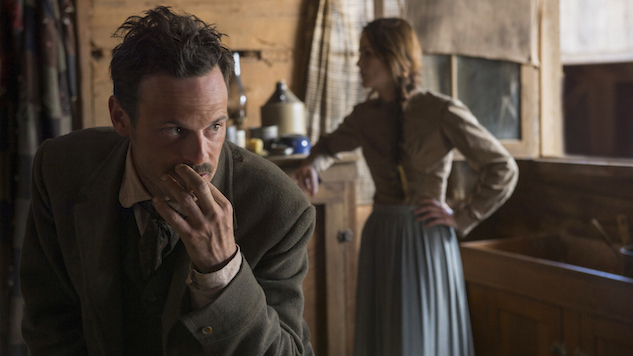 So when we discover that one of the protagonists of Godless, Sheriff Bill McNue (Scoot McNairy) is losing his sight, and its antagonist, Frank Griffin (Jeff Daniels), becomes right-handed by process of elimination, we’re placed in a dilemma. These disabled and impaired men don’t exist in this unforgiving world, and the lengths they go to in order to remain are the fearful struggles of displaced, emasculated men we still see today. It may seem odd to focus on the men in a series sold on its female-driven premise—a mining town named La Belle is populated almost exclusively by women after a mining disaster wipes out its able-bodied men—but that’s exactly what the series does. In fact, as others have pointed out, Godless gives most of its screen time and dialogue to its men. It focuses on the men who remain around the town and how they relate to it. If anything, juxtaposing its leads with La Belle makes its focus on manhood even more prominent: How will these men act around a group that operates as both the ultimate temptation to bands of outlaws and the ultimate protector of its surviving lawman? The way it’s framed (which I’m not saying is right), the series is about its broken men and their lives around these women. Scott Frank’s Netflix series had many of its genre-related themes predated by Logan, Frank’s co-written pseudo-western superhero tale released earlier this year. In it, the mutant star sees his rejuvenating powers fade and the effects of old age begin to blight. There is a black-and-white version of the film, the old-timey contrast and grime of which mimic the stoic manhood at its center. It also uses 1953’s cowboy film Shane as a name-dropped touchstone. Godless leans on much of that old-fashioned feel, filling the town of La Belle with genre mainstays like they all came on the same wagon train. Mining, as opposed to the relatively benign professions of farming or ranching, was always the most dangerous risk—compounded by the gamble of the journey west itself. Miners chasing rushes often came away with nothing but disease and injury. But for the two at the heart of the central conflict (putting aside Jack O’Connell’s bullet-riddled but able-bodied Roy Goode), these disabilities drive them rather than end them. One uses his disability to inform his God complex with a savior’s martyrdom, while the other allows his to augment his pursuit of justice. Both had their masculinities informed and changed by their physical decomposition—especially since it was an era when disability was increasingly associated with a loss of manly independence. The book Phallacies: Historical Intersections of Disability and Masculinity analyzes the use of prosthetics after the Civil War, finding a debate between those who wish to make their physical difference invisible and those who want to display it proudly. This is part of what historians and disability researchers call “the dilemma of disabled masculinity.” The latter group in this struggle, often amputees like Griffin, would pin up their empty sleeve to make a sacrifice visible. That’s an honorable scar, a battle wound—and if you keep the rotting amputated arm, maybe it becomes part of your mystical outlaw legend instead of a weakness reinforcing your old age. (Daniels is around 20 years older than the life expectancy of the time period.) The U.S. National Library of Medicine posits that most disabled men during this period sought prosthetics to better help their families. The West was different. Prosthetics were as non-existent as their salesmen and families were scarce, even if you weren’t an outlaw. Griffin is making the best out of a bad situation to salvage his need for paternal dominance, which gets exercised in almost every episode as he saunters in politely, establishes himself as patriarch, then shoots his way out. McNue has trouble establishing himself as anything but a coward. His fading eyesight makes him wary to read a menu, let alone shoot his gun at some troublemakers. In this violence-driven era, his encroaching blindness is an impotence made worse by his profession as a lawman. He seeks solace in mysticism and homeopathy before turning to a blend of prescription and spirituality (a Native American ghost!? )—all sources of questionable reliability for an Old West sheriff. The one thing that does seem to work is a technology dealt by a travelling snake oil salesman: spectacles. Back then, spectacles (not eyeglasses, which didn’t have temples) weren’t uncommon, but they weren’t well-trusted and certainly weren’t available to most on the outskirts of civilization. But McNue stumbles upon someone to solve his problem, offering the necessary lenses to make him feel like a competent, and potent, man again. A quick sidebar on these glasses. The spectacles purchased by McNue don’t just address his problem, they help date the series: Let’s look at U.S. Patent #139,909 by G.W. Meigs of Hartford, Connecticut. He received a patent on wrap-around temples on June 17, 1873. Before this, this style was extremely rare in America, often jerry-rigged by individuals rather than mass produced. So Godless should take place post-1873. But that’s a bit besides the point. The main point is that even though they solved the problem at hand, spectacles were signs of old age, enfeeblement, blindness, and bookishness. None of those are qualities a sheriff wants to project, and a strange man with a wagon full of unguents and tonics isn’t the first place you’d go for them. The Ocular Heritage Society found newspaper warnings saying that “there is no trading in a small way by which people are more grossly cheated than by peddlers who deal in spectacles” after travelling salesmen gained a reputation for misrepresenting frame materials or optical quality. Here, like with prosthetics, the choice was either to use an emasculating, attention-grabbing crutch or grit it out until you die. You may not be surprised that for these men, it was a difficult choice. McNairy’s difficult performance is one of desperation and pain. Each time his encroaching blindness is called out, you can feel the heat of his shame. That same shame is levied against newspaperman A.T. Grigg (Jeremy Bobb) when the Griffin gang mocks him for his tear-leaking eye, which he sustained from a bottle-to-face domestic dispute, as his disability more clearly marks him as something a man should not be: a crier. You can squint, you can have one arm, but God(less) help you if tears leak from your eye. The same goes for the mentally handicapped survivor of the town’s mine disaster, John Doe (Travis Hammer), whose very personhood is devalued almost to nothing. These men are stuck dealing with very visible physical and mental disadvantages during a period where a man’s body was inexorably linked to his worth. All but Doe seek greatness—to defeat evil and prove their value, to make a name for themselves in the press, or to cement their legend by maintaining their outlaw posse/family. All feel responsible for different gangs, townsfolk, and readerships; all must go to great, desperate, and (some might say) self-defeating ends to assert themselves as men who were not known for their disability but men that did what they did despite their disabilities. To find worth outside the body, driven by the body, is the dilemma of these Godless men and much of masculinity, as least as it’s traditionally defined. Dancing around its gender-swapped genre tease with this approach may feel duplicitous, but its gendered stakes — “How many women need my help / are up for grabs?” are the male characters’ main questions — are necessary to inspire its impaired men. The Western is so male-oriented that it takes a town full of women to make a show about even slightly damaged masculinity. We see this again in Logan: A dying superhero fights not for himself, but for the young girl for whom he feels responsible. The baby steps Godless takes in unpacking its maleness from a premise of matriarchy makes it obvious just how far the genre has to go. Godless is now streaming on Netflix. Read Paste’s review here.